Deep in your Soul, at the level of your most authentic self, you are not like anyone else. And yet… too often your actions come from an inauthentic place: a place of trying to be like others and fear that if you be who you really are, you will be rejected. Truly happy, successful, and financially abundant people don’t allow their fears to prevent them being themselves. Did they have those fears when they started doing it? Absolutely! 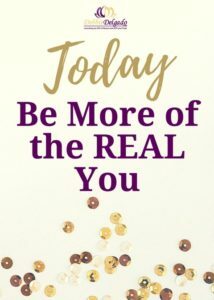 The authentic you is so much more beautiful, talented and powerful than any “script” you’re currently reading about how you’re “supposed to” or expected to be. What would it feel like to stop reading that script every day? What would your life be like if you unleashed the real, unique, beautiful, weird and wonderful you – starting right now? To be more authentic, connect to your own divine gifts – AND let your freak flag fly! You’ll be amazed at what will happen when you do! Does being more of you scare the living daylights out of you? Contact my amazing assistant Kathy Bliss and she’ll help you assess whether a conversation with me might help!